Next Byte was a sole proprietorship we formed to market & sell the MacVet product. At the time, most small business software ran on IBM Personal Computers, including veterinary clinic management systems. A personal friend who was also a veterinarian, complained he could not find software to manage his clinic that was easy to run and easy to maintain. The Apple Macintosh - just introduced in 1984 - supported a networked version of the cross platform (both PC and Mac) Omnis 3 relational database manager. Working with our friend we designed & wrote MacVet using Omnis 3. 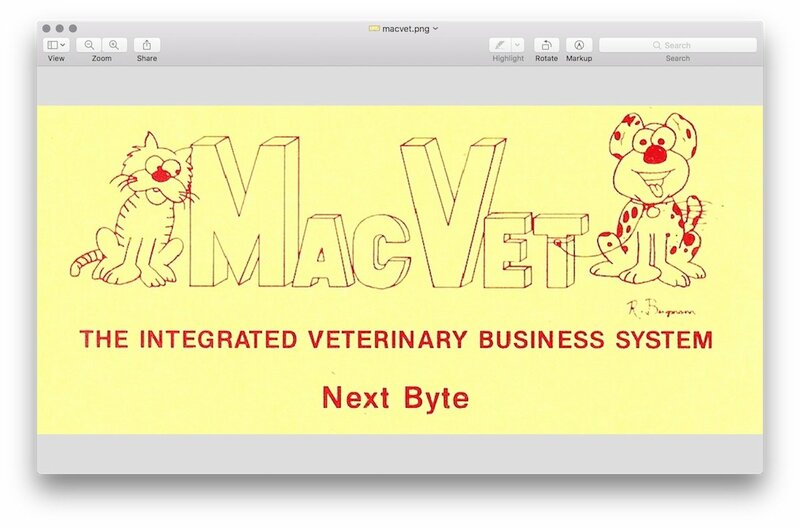 My wife & I worked together with John, our veterinarian friend, to develop MacVet. I wrote the code, she wrote the user documentation. Based on John's input and looking at competitive systems, we added most of the functionality needed by small veterinary clinics. MacVet supported multiple clinics, heard health records and reminders, small/large animal tracking, inventory, and invoicing. John loved running MacVet for his clinic and was our advocate to other vets. Apple advertised it in their early Apple Solutions magazine. We received lots of inquiries from the Apple publication as well as good feedback from the trade show and direct marketing we did. Ultimately we stopped developing MacVet and closed Next Byte since my wife & I were both working full time jobs, raising a family, and building a house. Plus, we had found some interesting reaction from our marketing efforts. First, veterinarians were very conservative: while the Mac interface was easy to use, vets were reluctant to consider the new Mac over the better known IBM PC. Second, when a clinic expressed serious interest they would often approach us with "... if you will just add xxxx functionality to MacVet, then we'll consider buying a system. If not, we won't. We've got to have that feature." The requests ran from simple to complex; some even bordered on questionable ("We need you to make it so we can just make an invoice 'disappear' when we need to ... we have our reasons ... ") Our lawyer said we _could_ add that feature; it was up to the clinic as to how they reported income, not us. But at that point we decided we were better off not even heading down the path. The irony of our MacVet experience was that while we did ultimately sell a couple systems, we made more money by selling demo disks! Nearly everyone who showed interest in the system was willing to send us money for a demo disk and an instructional scenario. To this day, I still find it funny that we made more money, with less support requirements, by just selling product demonstrations.